For two years, the global warming debate had been conducted in a heretic-hunting and illiberal environment. It was deemed blasphemy for anyone to dare question not only the climate science but the policy consensus to decarbonize the economy. Mr. Rudd even claimed that climate change was the “great moral challenge” of our time and even denounced critics of cap and trade as “deniers” and “conspiracy theorists.” The hapless Liberals led by Mr. Turnbull—an Oz version of Mitt Romney—were in the deepest political valley. Mr. Abbott, then widely written off as a remnant of the Howard era, decided to challenge the media-political zeitgeist. Cap and trade, he argued, merely amounted to economic pain for no environmental gain, especially for a nation that accounted for only 1.4% of greenhouse gas emissions. He contested the Liberal party leadership, winning by a single vote. Then along came the failed 2009 Copenhagen summit, which exposed the Rudd agenda as a sham. When the rest of the world refused to endorse the climate enthusiasts’ fanciful notions for slashing carbon emissions, Mr. Rudd imploded. 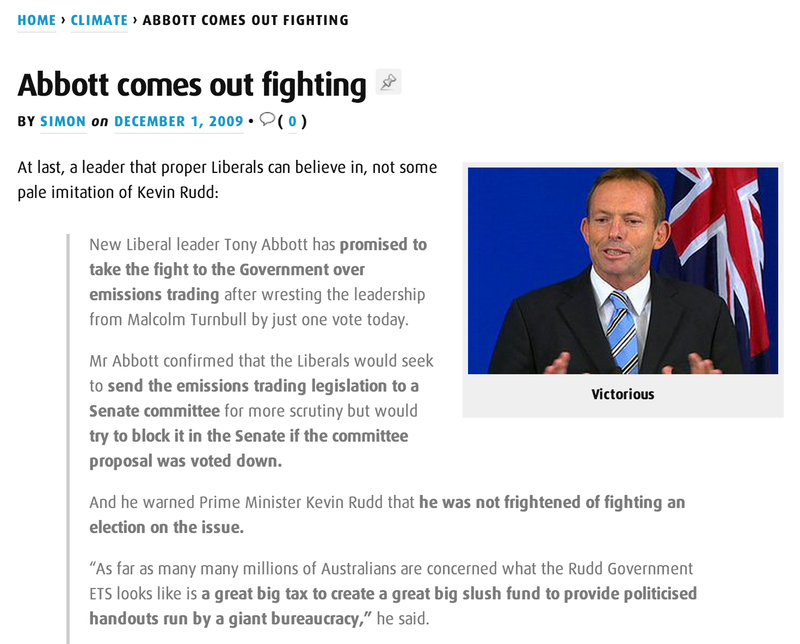 Mr. Abbott seized the moment and highlighted the higher energy costs created by Labor’s emissions trading scheme. Almost overnight, Mr. Rudd’s stratospheric poll figures cratered. Facing a changing (political) climate, he ditched the emissions trading scheme, his government’s key-note legislation. Rudd’s popularity slipped and he was knifed by his own party soon afterwards. In the election of 2010, as climate alarmism’s downward spiral was well underway, Julia Gillard shackled her fortunes to the Greens, environmental extremists who demanded urgent action on climate as part of the deal to support Labor. Gillard was forced to break her pre-election promise on the introduction of a carbon [dioxide] tax, and from that moment, trust in her and Labor was gone. Once again languishing in the polls, Labor, in a fit of desperation, reinstated Kevin Rudd, forgetting all the leadership dysfunction and chaos of his first stint, and believing him to be the Messianic figure that would transform Labor’s fortunes. Wrong. The veneer of “new Kevin” chipped and cracked within days to reveal the same “old Kevin” underneath. Voters (and his own party) had had enough. Thus, Tony Abbott became Prime Minister of this great country. Abbott has consistently mentioned words like ‘deliberate’, ‘methodical’, and ‘considered’ as his preferred style for governing. That alone will be a most welcome change but I hope that it also includes re-visiting the science of climate change (by that I mean getting hotter and/or COLDER) because, try as I do, I just cannot see any evidence that CO2 has ever been a mayor driver of climate change, not in the 4.5 billion-year history of the planet. In the 2010 Australian federal election the Greens picked up 11.7% of the vote. In this election the Greens only managed 8.4%. Yes, that is good news but Greg Hunt worries me (as does Malcolm Turnbull) because they talk as if they believe that CO2 has a major effect on climate. They just think that there are better ways of dealing with it, like direct action. I would feel much more comfortable if these two conceded that the science does not stack up, especially as it hasn’t warmed for 15 years, and that the science needs re-visiting. Check out the most viewed and most shared story from the UK telegraph today…. Surely the hoax can’t last much longer.